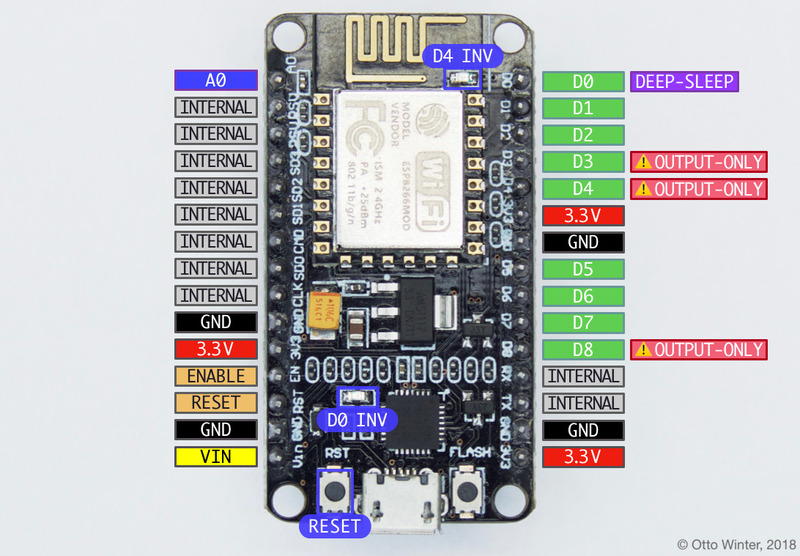 The NodeMCU board is fully supported by ESPHome. Simply select ESP8266 when the ESPHome wizard asks you for your platform and nodemcuv2 as the board type. Most NodeMCU that can be purchased now are version 2 or upwards, if you’re using an original v1 board, set the board type to nodemcu. The NodeMCU’s pin numbering as seen on the board (the D0 etc pins) is different from the internal pin numbering. For example, the D8 pin number maps to the internal GPIO0 pin. Fortunately ESPHome knows the mapping from the on-board pin numbers to the internal pin numbering, but you need to prefix the pin numbers with D as in below image in order for this automatic mapping to occur. Pins on the NodeMCU ESP8266 development board. D0 also can be used to wake the device up from deep sleep if the pin is connected to the RESET pin. D0 is additionally connected to the LED next to the UART chip, but in an inverted mode. D3, D4 and D8 are used on startup to determine the boot mode, therefore these pins should not be pulled low on startup. You can, however, still use them as output pins. A0: This pin can be used as a normal GPIO pin (like D1 etc) but additionally can measure voltages from 0 to 1.0V using the Analog To Digital Sensor. VIN: This pin can be used to use an external power supply with the board. Supply a voltage from 3.3V to 12V to this pin and the linear voltage regulator on the board will power the board.